An example of an apostille from Japan. The best and most accurate means to describe the Apostille Convention is to use its formal name: The Hague Convention of 5 October 1961 (Abolishing the Requirement of Legalisation for Foreign Public Documents). As you might already know, if you plan on using legal documents outside of South Africa, you will have to get them apostilled in order to ensure their validity. In this post, we will be taking a look at which countries form part of the Apostille Convention, and also look at what your options are for getting documents legalised for use in a country that doesn’t form part of the Apostille Convention. The Hague Convention, as it is known in short, replaced the “Requirement of Legalisation for Foreign Public Documents”, which was a tedious way of having to confirm documents between countries (both countries had to sign two different confirmations in the past. Also know as the Convention de La Haye du 5 Octobre 1961, or the Apostille Treaty, the Apostille Convention is an international treaty created by the Hague Conference on Private International Law. Basically, it defines how a document issued in any of the member countries (signatory countries) can be certified for use among all the other members countries. 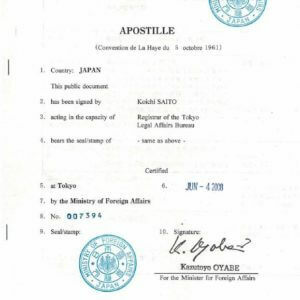 Thus, if both South Africa and Japan belong to the Apostille Convention, then an apostille is used to confirm the document between the two countries. Within South Africa alone, an apostille would be the equivalent of a notarisation by a notary public. Who are the Member Countries of the Apostille Convention? For a full and up to date list of signatory countries, please click through to The Hague Conference on Private International Law. Which are the Hague Conference Connected States? If you need documents certified and legalised for a non-apostille member country, you’ll need to take steps such as state verification or department of state verification if needed, and Embassy or Consulate legalisation. Depending on the type of document you need to have legalised, the origin of your document, and the country requesting your document, the process of legalisation may differ. Contact us in this case for help.